Showing results for tags 'mushroom'. 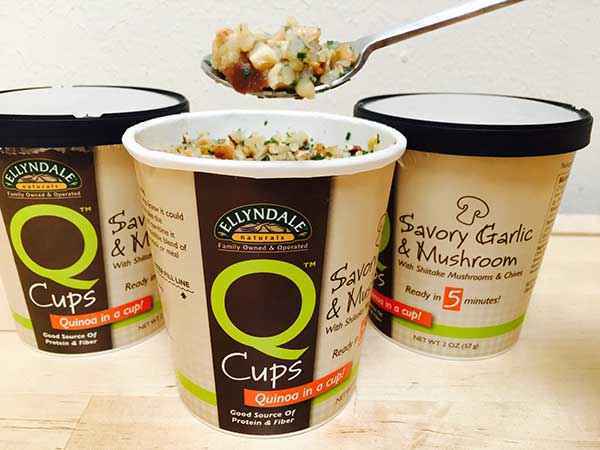 I tried a Q Cups™ Savory Garlic & Mushroom for lunch yesterday and was pleasantly surprised. Many of the meals in a cup that I've tried are overpowering in flavor, but not Q Cups™. The hearty texture and taste came mostly from the quinoa and shiitake mushrooms. There was a mild hint of seasonings that included chives, garlic, celery, thyme, and bay leaves. My overall impression was that in just 5 minutes I could have a healthy, gluten-free meal. Q Cups™ are perfect for a quick lunch at the office, or to take on camping trips or planes. Visit their site for more info. Celiac.com 04/15/2016 - Among the winners in the eighth annual British Pie Awards in Melton Mowbray, The Rutland Pie Company, based in Pillings Road, Oakham, was highly commended in the dessert pie class. Rutland's head pie maker Ian Curtis also won a gold award for his steak, ale and mushroom pie; silver for a cold chicken, ham and leek pie, and bronze for his gluten-free steak, ale and mushroom pie. Curtis said: "This is only our first proper year of trading so to be recognized at the British Pie Awards is fantastic - I'm really proud. I was particularly pleased my gluten-free pie was recognized. It took a lot of effort to get the recipe right - using a mix of rice, tapioca and potato flours. It's great that local pie makers are getting the recognition they deserve." Matthew O'Callaghan, chairman of the British Pie Awards, was full of praise for those who earn a crust producing top quality pies. He offered his "sincere thanks to all involved, including our judges, sponsors, volunteers and of course, all our wonderful pie makers." Winning chefs wowed a panel of top pie experts, including TV chef Andy Bates, food critic Charles Campion and chef Rachel Green. Meanwhile, those in the Oakham area looking for a good gluten-free pie might want to stop by the The Rutland Pie Company in Pillings Road. Read more at the Stamfordmercury.co.uk. Celiac.com 10/15/2015 - This chicken blends creamy mushroom soup, sour cream, sherry and paprika for a risk, yet subtle flavor that is sure to please. Instructions: 6 bone-in chicken breast halves, with skin 1 (10.75 ounce) can condensed cream of mushroom soup OR about 1½ cups of Chantarell Mushroom Soup 6 ounces fresh mushrooms, cooked down, with pan liquid 1 cup sour cream ½ cup cooking sherry 2 tablespoons water 1 tablespoon paprika Directions: Heat oven to 350 degrees F. Place chicken breasts skin-side up in a large baking dish. In a medium bowl combine soup, mushrooms with liquid, sour cream and sherry. Mix well and pour over chicken. Sprinkle with paprika. Bake at 350 degrees F for about an hour or so, until chicken is cooked through and tender, and juices run clear. Adjust sauce thickness with water or corn starch, as desired or needed. Serve over rice, potatoes, or gluten-free noodles. Celiac.com 03/17/2015 - I can hardly count the number of times I've come across a recipe that calls for condensed cream of mushroom soup. The problem, or course, is that Campbell's, and many other brands contain wheat. Now, to be fair, there are a number of brands that make a gluten-free cream of mushroom soup. Still, if you want to make it from scratch, this recipe yields a rich, delicious soup that will go great in any recipe that calls for condensed canned mushroom soup. This recipe equals to one can condensed cream of mushroom soup. Ingredients: 5 tablespoons butter 2 cups diced fresh mushrooms, about ½ pound ½ tsp. dried onion flakes 1 pinch celery seed 1 pinch garlic powder ½ cup evaporated milk ½ cup whole milk, plus ¼ cup for rice flour paste ½ teaspoon salt ¼ teaspoon pepper Directions: In heavy saucepan, add one tablespoon butter and mushrooms, and sauté until lightly browned. Remove from pan and reserve (mushrooms will now measure approx. 1 cup. Heat, in same saucepan, heat 4 tablespoons butter, ½ cup whole milk and ½ cup evaporated milk. Stir in dried onion flakes, celery seed, garlic powder, salt and pepper. In a separate bowl, make a smooth paste of 2½ tablespoons sweet rice flour, and ¼ cup whole milk. Add paste slowly to heating mixture. Stir constantly until thickened. Stir in reserved mushrooms and heat through. Use in casserole recipes, or add 1 cup of whole milk to make soup. This recipe comes to us from “tarnalberry” in the Celiac Disease Message Board. Ingredients: 1 cup Lundberg Farms Wild Blend Rice (you can substitute brown rice, or your own mix of brown and wild rice, but this mix works best of the variations Ive tried so far, definitely do not do all white rice) 1/3 cup arborio rice (risotto) 3 medium carrots 3 stalks celery 1 medium onion 2/3 pound mushrooms (chanterelles are very good here, as are creminis (or portabellas), plain white wouldnt be the same) 3 tablespoons olive oil 4 cups (or more) chicken or vegetable broth 2 teaspoons Italian spices (or ½ teaspoon each basil, oregano, thyme, rosemary) 1 teaspoon salt ½ teaspoon ground sage ¼ teaspoon majoram pinch cumin (optional) Directions: Finely dice the carrots, celery, onion, and mushroom. Heat a 6 quart (or so) pot on the stove, then add the olive oil. Add the carrots, celery, onion, and mushroom, and stir to coat. Continue cooking, on medium high heat, stirring often, until the onions turn translucent. Add the rices, and stir to coat further, for a minute or so. Add enough broth to just cover the ingredients, and turn down to a simmer. Continue to cook just like risotto - stirring almost continuously (no less than every three or four minutes), and adding broth, a half cup at a time. After 30 minutes, add the spices. Continue adding broth, even after the four cups, if the rice is not done, but is very thick and needs more liquid to keep from burning at the bottom. And keep stirring! When the rice is cooked through, turn off the heat and serve. Celiac.com 06/05/2014 - Pork tenderloin is one of my favorites, and this recipe offers an easy, tasty meal that will keep your hungriest eaters smiling. Ingredients: 2 tablespoons butter 2 large shallots, minced 2 cloves garlic, minced 1 cup minced mushrooms 1½ pounds pork tenderloin medallions 1 teaspoon potato starch, or corn starch ½ teaspoon ground black pepper ½ cup whole milk yogurt 1 tablespoon cream cheese ¼ cup dry white wine or vermouth ½ tablespoon fresh thyme Directions: Heat oil in a skillet over medium heat. Salt and pepper the pork and add to pan. Cook until lightly browned. Remove pork, and keep warm. To the skillet, add butter, shallots, thyme, and garlic. Stir and cook 2 minutes or so, until soft. Add mushrooms and sauté about 3 minutes. Stir in wine, cook another couple of minutes, until soft. Whisk in yogurt and cream cheese, stirring for another 30 seconds or so. Whisk in potato starch or corn starch, as desired. Return pork to pan, reduce heat to low, and cover. Simmer for 5-10 minutes, stirring occasionally. Serve over rice. You want decadence? Want to feel like you're sitting down to the first course of a very sumptuous dinner at the finest country manor house? This rich, velvety wild chanterelle mushroom soup will do the trick. This recipe is a bit involved, but don't be put off. If you can get wild chanterelles, have some time cook, and want an over-the-top mushroom soup, it is well worth the effort. Velouté Ingredients: 6 cups chicken stock 2 tablespoons unsalted butter 2 tablespoons potato flour Soup Ingredients: 1½ pounds wild chanterelle mushrooms, cleaned and trimmed 1 leek, washed and minced 2 shallots, minced 3 cloves garlic, minced ½ teaspoon crushed red chili flakes 4 tablespoons unsalted butter 3 egg yolks ½ cup cream 1 shot añejo tequila ¼ teaspoon saffron Salt to taste Directions: Heat the stock to a bare simmer. In another pot, heat the butter until frothing and stir in the flour. Stirring all the while, let this cook for a few minutes over medium heat. Do not let it brown. Whisk the hot stock into the roux and let this simmer for 20 minutes, whisking often. Let it slowly cook down by at least ⅓ until it silky looking. While the velouté is simmering, make the mushroom base. Mince the mushrooms, leeks and shallots and sweat them in a sauté pan over medium heat with a touch of salt. Cook gently, stirring often, until the leeks and shallots are translucent and the mushrooms give up their water. Crumble the saffron into the tequila and add it to the mushroom base. Turn the heat up to high and toss or stir to combine. Cook until the tequila is nearly gone. Purée the mushroom base in a food processor. I like a slightly chunkier soup, so I do not push this puree through a fine-mesh strainer, though you may do so for a really silky finish. When the velouté is rich and silky, add the mushroom puree and stir well to combine. Cook this at a bare simmer for 10 minutes. Beat together the egg yolks and cream, then ladle, little by little, some soup base into the egg-cream mixture. This is called a liaison, the goal is to temper the eggs with the hot stock slowly, so they mix well and do not congeal, so go slow! Once you have 3-4 ladles of soup into egg-cream mixture, pour it all back into the soup and simmer. Remember: SIMMER! DO NOT BOIL! To finish the soup, turn off the heat and whisk in the remaining butter. Serve with the seared mushrooms in the center, with a dry white wine. For an optional mushroom garnish, slice a few chanterelles lengthwise and sear them in an dry pan until they give up their water and brown. This soup goes great alone, or as a prelude to a more detailed meal. A good risotto is a thing of beauty, a delight to the palate, and a joy to the stomach. During my travels in Italy a few years back, risotto was one of the dishes that never let me down. I tried risottos of every conceivable type and description. One of my favorites was a mushroom risotto infused with hints of lemon. My efforts to duplicate that particular risotto have culminated in this recipe. Enjoy! Ingredients: 6 cups chicken broth 3 tablespoons butter, in small pieces 2 tablespoons olive oil 1 pound portabella mushrooms, thinly sliced 1 pound porcini or crimini mushrooms, thinly sliced 2 large shallots, chopped 1 medium garlic clove, minced 2 cups arborio rice or medium-grain white rice ⅓ cup dry white wine 3 tablespoons finely chopped chives 2 tablespoons chopped fresh parsley 2 tablespoons fresh Meyer lemon juice 4 teaspoons grated Meyer lemon peel 1 cup freshly grated Parmesan cheese Sea salt to taste Freshly ground black pepper to taste Directions: In a saucepan, warm the broth over low heat. In a medium stock pot or a Dutch oven, warm 2 tablespoons olive oil, over medium-high heat. Stir in the mushrooms, and cook until soft, about 3 minutes. Remove mushrooms and liquid, and set aside. Add 1 tablespoon olive oil to skillet, and stir in the shallots. Cook 1 minute until shallots are clear, but not brown. Add garlic and cook until aromatic. Add rice, stir well to coat with oil. Cook about 2 minutes, until the rice turns a pale, golden color. Pour in wine, stirring continually until the wine is fully absorbed. Add 1/2 cup broth to the rice, and stir until the broth is absorbed. Continue adding broth 1/2 cup at a time, stirring continuously, until the liquid is absorbed and the rice is al dente, about 15 to 20 minutes. Remove from heat, and stir in butter, mushrooms and mushroom liquid, parsley, chives, lemon juice, lemon peel and Parmesan. Season with salt and pepper to taste. Celiac.com 06/04/2013 - Frittatas are great to whip up for a weekend brunch, when you want to add a bit of flair to your breakfast omelet, or when you want to show little extra love to your guests. This recipe includes ham, asparagus, mushroom and fontina cheese, but feel free to improvise as you like. Frittatas are an excellent way to use up whatever meats or vegetables you may have laying around. Ingredients: 6 large eggs 2 tablespoons whipping cream ½ teaspoon salt, plus a pinch ¼ teaspoon freshly ground black pepper 1 tablespoon olive oil 1 tablespoon butter ½ medium onion 6 ounces asparagus, trimmed, cut into 1/4 to 1/2-inch pieces 6 ounces of brown mushroom, cut into small wedges 3-4 ounces ham, chopped 3 ounces Fontina cheese, diced ½ ounce Romano cheese Salt and freshly ground black pepper Directions: Turn on the broiler. Whisk the eggs, cream, ½ teaspoon salt, and pepper in a medium bowl to blend. Set aside. In a nonstick 9 ½-inch ovenproof skillet over medium heat, sauté mushrooms and onion in butter until the onions are clear to brown. Remove, drain and set aside. Wipe the pan clean, and then heat the rest of the oil and butter over medium high heat. Add the asparagus and sauteé until crisp-tender, about 2 minutes. In the last 30 seconds, or so, add ham. Add mushrooms right at the end and mix well. Pour the egg mixture over the asparagus, mushroom and ham mixture, and cook for a few minutes until the eggs start to set. Sprinkle with both cheeses. Reduce heat to medium-low and cook until the frittata is almost set but the top is still runny, about 2 minutes. Place the skillet under the broiler. Broil until the top is set and golden brown on top, about 5 minutes. Let the frittata stand 2 minutes. Using a rubber spatula, loosen the frittata from skillet and slide the frittata onto a plate. If you love macaroni and cheese, then you will likely also love risotto. This recipe makes a delicious, creamy risotto that is big on cheese and packs the rich, subtle flavor of mushrooms. It makes a great addition to grilled meat, or all by itself. Ingredients: 4 cups chicken broth, divided 3 tablespoons olive oil, divided ¾ pound portobello mushrooms, thinly sliced ¾ pound white mushrooms, thinly sliced 2 shallots, diced 1 cup Arborio rice ⅓ cup dry white wine 3 tablespoons finely chopped chives 4 tablespoons butter ⅓ cup freshly grated Romano cheese sea salt and freshly ground black pepper to taste Directions: In a saucepan, warm the broth over low heat. Warm 2 tablespoons olive oil in a large saucepan over medium-high heat. Stir in the mushrooms, and cook until soft, about 3 minutes. Remove mushrooms with their liquid, and set aside. Add 1 tablespoon olive oil to skillet, and stir in the shallots. Cook 1 minute. Add rice, and stir well to coat with oil, about 2 minutes. When the rice becomes pale and gold in color, add wine, stirring constantly until the wine is fully absorbed. Add ½ cup broth to the rice, and stir until the broth is absorbed. Continue adding broth ½ cup at a time, stirring continuously, until the liquid is absorbed and the rice is al dente, about 15 to 20 minutes. Remove from heat, and stir in mushrooms with their liquid, butter, chives, and parmesan. Add salt and pepper to taste. Very similar to fettuccine, tagliatelle is one of my favorite kinds of pasta. I especially like Schär brand gluten-free tagliatelle. When I was in Italy a while back, I enjoyed a tasty plate of gluten-free pasta in a porcini mushroom cream sauce. The dish was a home run, and when I got back to the States, I opened my cupboard and tried to duplicate the rich, flavorful sauce that had won my heart in Italy. After a few experiments, I settled on this recipe, which yields a creamy, delicious sauce and goes very well with the Schär tagliatelle I had on hand. The sauce incorporates parmesan cheese and will appeal to most macaroni and cheese lovers at your table. This recipe will yield 4 portions, so scale accordingly. Ingredients: 2 cups of fresh porcini mushrooms, or 1 cup dried porcinis (shiitake, or other mushrooms also work, but I like the flavor of the porcinis) ¼ cup dry vermouth 1 pound gluten-free tagliatelle or fettuccine (I use Schär brand) 2½ cups heavy cream 2 tablespoon olive oil 4 tablespoons unsalted butter ½ cup shallots, minced ⅓ cup fresh carrots, lightly steamed and julienned 4 teaspoons garlic, minced 4 teaspoons fresh Italian parsley, minced 1 teaspoon chopped fresh thyme 2 teaspoons chopped fresh oregano 2 teaspoons salt 1 teaspoon freshly ground black pepper, to taste 1 cup grated Parmigiano-Reggiano cheese Directions: Slice and sauté the mushrooms in a bit of butter, and 1 teaspoon of garlic, until soft. Add vermouth right at the end and simmer a couple of minutes. If you use dried mushrooms, then put them in a covered bowl of hot water for about 20 minutes, until they are soft, then squeeze any excess water from them before you slice and sauté them. Save the liquid for use later in the cooking process. Strain the liquid from mushrooms into a clean bowl. Set both the mushrooms and the liquid aside for later. Bring a large pot of salted water to a boil. Add the tagliatelle and cook until al dente, as per instructions. Meanwhile, heat the oil and melt the butter in a large skillet over medium heat. Add the shallots and stir about 2 minutes until soft. Add 2 teaspoons of garlic and stir for about 30 seconds. Add the chopped mushrooms, and cook, stirring, for 2 minutes. Add the mushroom liquid, bring to a boil, and cook about 1-2 minutes, stirring occasionally, until the liquid is nearly evaporated. Add the cream, thyme, salt, and pepper and return to a simmer. Cook about 5 minutes, stirring occasionally, until the cream thickens. Add the parsley and mix well. Drain the pasta and add to the pan with the sauce. Sauté for about 2 minutes and mix until the pasta is well-coated with the liquid. Add ½ cup of the cheese, toss, and remove from the heat. Divide the pasta between two large bowls, and top each with a portion of the remaining cheese. Garnish with fresh carrots for color, and and serve immediately. I'm a person who loves beef, who loves mushrooms, and who loves soup, so you can imagine how I feel about beef mushroom soup. There are numerous variations on this dish, but, again, as with so many soups, simplicity is the key to success. In this version, tender, delicious beef, juicy, succulent mushrooms, and rich, tasty broth all come together with sherry and vegetables to consummate a kind of culinary love affair right on the kitchen stove. The result is an epicurean delight we know as beef and mushroom soup. I like to use a variety of fresh, local wild mushrooms whenever possible, but any of your favorite mushrooms will do. This recipe makes enough soup for six to eight servings. Ingredients: 3 tablespoons of extra-virgin olive oil 1¾ to 1 pound cross-cut meaty beef shank bone 1½ pounds of boneless beef chuck, cut into 1-inch cubes 6 cups mixed porcini, crimini, oyster or other mushrooms, brushed clean and sliced thick 1 can crushed tomatoes (14.5-ounce), with juice 3 carrots, washed and halved 3 celery stalks, halved 5 cups beef broth ½ cup sherry 2 tablespoons chopped fresh thyme, divided 3 bay leaves 2 cups chopped onions 3 cloves of garlic, sliced in half Directions: Heat olive oil in large pot over medium-high heat. Add shank bone and meat cubes to pot. Season with salt and pepper. Cook about 15 minutes, until meat is brown and juices reduce to a glaze, making sure to turn bone from time to time. Add the bay leaves, along with 1½ tablespoons thyme; stir 1 minute. Add onions and celery, and cook about 3 minutes, until translucent. Add beef broth, tomatoes with juice, carrots, and mushrooms. Bring soup to boil. Reduce heat to medium-low, cover, and cook until beef is tender, about 1 hour or so. Discard shank bone and bay leaves. Use tongs to remove carrots and celery. Allow vegetables to cool, then slice them and return them to soup. Season soup to taste with salt and pepper. Ladle into bowls. Sprinkle a dash of the remaining ½ tablespoon thyme onto each bowl and serve. I based this recipe on one from UKTV Food. This pie has a crisp golden pastry and succulent rich filling. Pureed beans and onion thicken the sauce. If you don't want to puree them just add them to the rest of the ingredients at the start of the slow cooking stage. Serves 6-8 Ingredients: 1 pack diced venison (c340g) 1 pack mushrooms (c 200g) I used chestnut 1 bottle beer - I used Nick Stafford's Hambleton Ales GFA Gluten and Wheat Free Ale 2 onions - chopped 2 carrots- diced 3 cloves garlic - squashed vegetable oil 1 tsp. fresh thyme leaves or 1/4 tsp. dried stock / water - I used chicken as I always have that available in the freezer. 1 small can beans - cannellini / borlotti or gluten-free baked beans 1 tbsp. tomato paste pepper Pastry: 500 g gluten-free flour (40% urid (lentil), 40% tapioca, 20% cornmeal) 250 butter water to bind egg wash for pastry top if wanted (an egg beaten with a little water, brushed on to pastry before cooking). Directions: Trim any cartilage from the venison pieces. Dry with paper towel. This will make it spit less when you fry it. Cover the bottom of your pan with a thin layer of oil. Place individual pieces of meat in this oil when hot and allow to brown. Don't over-crowd the pan; you may need to do it in two batches. When the meat is brown set aside in another dish. Put the onion and whole squashed garlic cloves in the pan and cook slowly until translucent. Add extra oil if needed. Remove from the pan. Cook the carrots and mushrooms for two or three minutes then add the meat back to the pan. Add the stock, ale, thyme, tomato paste and pepper, and also salt if you want to. The liquid should cover the meat. Put the lid on and simmer gently for 1.5 hours, checking the levels of the liquid every half hour or so. If it is getting dry add some water. Meanwhile, put the cooked onions, garlic and the can of un-drained beans in a blender and puree. This will form the thickened gravy for the pie. You can leave the onions and beans un-pureed if you prefer. When the meat and vegetables have cooked for the hour and a half, add the bean and onion puree. Check for seasoning. Cook for a few minutes, stirring, until the gravy is the texture you like. This stew is now ready to be eaten by itself, frozen for another occasion, or used as the pie filling. Leave to cool before making the pie. To make the pastry: cut the butter into the flour either by hand or in the food processor. Add water a little at a time until the dough coheres in a slightly claggy ball. Wrap in cling film and set aside for at least fifteen minutes for the flours to absorb the water. If you make it ahead of time, keep it in the fridge but allow it to come to room temperature before rolling out or it will be too stiff to work. Roll pastry out on a floured board to fit your pie dish or dishes. This recipe is enough for two 1 pint / half liter pie dishes. If you aren't sure of the fit of your dishes, measure how much stew you have and see how that much water fits into your dish. Place a layer of pastry in the bottom of the dish and put the cooled filling in. Dampen the top edge of the pastry and place on the top layer of pastry. Crimp or fork the edges together. Brush egg wash on if you want a deeper golden and shiny pastry. Bake for 35 minutes at 170C until pastry is golden brown. Left over pastry can be made into jam tarts, or rolled out and frozen between greaseproof paper sheets until wanted. Falling in love with this sophisticated version of a true classic has helped me to leave the days of canned tomato soups behind. The added sausage and mushrooms gives this soup substance, and help to marry the herbs and fresh tomatoes to create flavor that is at once hearty and elegant. This dish goes great with a grilled cheese sandwich made with gluten-free bread and any bold, salty cheese. Ingredients: 6 large tomatoes, chopped with juices reserved 2 tablespoons tomato paste ½ pound cremini mushrooms, sliced 1 pound spicy Italian sausage 1 small onion, diced ½ cup red bell pepper, diced ½ cup green bell pepper, diced 1 ½ tablespoons garlic, minced 2 tablespoons olive oil 3 cups chicken stock 1 tablespoon dried marjoram 1 tablespoon dried oregano 1 bay leaf Salt and pepper to taste Directions: Heat olive oil in a large pot over medium heat. Add sausage and break up into small pieces with a wooden spoon. Stir occasionally until cooked. Add mushrooms, onions, and peppers and cook for another 8 minutes or until vegetables begin to caramelize. Add garlic and tomato paste and cook for another minute. Add tomatoes and their juices, chicken stock and herbs. Increase the heat to medium-high and bring to a boil. Reduce heat to low and let simmer for 20-30 minutes. Remove and discard bay leaf before serving. Stir-fries invite a blending of flavors and textures, so I always make it a point to look for ingredients that will compliment one another, and deliver loads of flavor. This dish is warm and filling and goes great over rice or gluten-free noodles. The roasted chilies and peppers heighten the soft texture of the mushrooms. This dish is also excellent when served chilled. When shopping for ginger, look for firm pieces free of any soft spots. Fresh ginger keeps for about a week. Make sure shitakes have thick caps and the fissures (the white underside) are white. Ingredients: 1 cup sliced shitake mushrooms 1 cup sliced oyster mushrooms 1 cup sliced button mushrooms 1 red bell pepper 2 finely sliced red chilies 1 jalapeño pepper 3 cloves minced garlic 2 tablespoons freshly grated ginger 1 teaspoon chili flakes 1 tablespoon olive oil 2 tablespoon sesame oil Directions: Slice and seed the red pepper, chilies and jalapeño. Arrange on a broiler pan and coat with olive oil. Roast until skins have charred. Remove, cover and let steam for 10 minutes. Scrape black skins off, chop and set roasted vegetables aside. Heat sesame oil in a large wok or frying pan. Add garlic and ginger and fry for 2 minutes. Add shitake mushrooms and cook for 2-3 minutes then repeat with oyster mushroom and button mushrooms, cooking about 2 minutes each time. Toss in roasted peppers, chilies, and chili flakes and serve. This recipe comes to us from Jan Ryan. Homemade recipe for Cream of Mushroom Sauce or Soup/Celery/Chicken* (from Sharon Larson). This is good and simple: In heavy saucepan, heat on medium: 1 Tbsp. Margarine Add, and sauté for 1 minute: 1 cup diced fresh mushrooms (approx. ¼ lb.) Remove from pan and reserve (mushrooms will now measure approx. ½ cup. Also, ½ cup of canned, drained mushroom bits can be substituted for mushrooms and margarine, if desired. If so, skip sauté step.). Heat, in same saucepan: 4 Tbsp. Margarine ½ cup evaporated milk ½ cup milk (I used 2 percent to cut down on fat) Stir in these spices: ½ tsp. dried onion flakes 1 pinch celery seed 1 pinch garlic powder ¼ tsp. salt 1/8 tsp. pepper Make a smooth paste of: 2 ½ Tbsp. SWEET RICE FLOUR ¼ cup milk Add paste slowly to heating mixture. Stir constantly until thickened. Stir in reserved mushrooms and heat through. Use in casserole recipes or add 1 CUP MILK FOR SOUP. Equivalent to one can condensed cream of mushroom soup. *VARIATIONS: CREAM OF CELERY SAUCE OR SOUP: Substitute 1 cup diced celery for fresh mushrooms. CREAM OF CHICKEN SAUCE OR SOUP: Substitute 1 cup diced raw chicken for fresh mushrooms and sauté for 3 min. OR substitute ½ cup diced COOKED chicken for canned mushrooms.